Conveen Optima Male External Catheter, manufactured by, Coloplast is a self adhering silicone catheter. 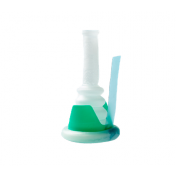 This external catheter features a simple, trouble free adhesive that provides an easy-on application and a double-grip strip. The double grip strip along with the sure-grip ribs help to ensure a secure and dependable fit. This product features a triple-action anti-leak system and anti-kink bulb. These features help to prevent urine back flow and leakage. Coveen Optima Catheter, available for SALE at Vitality Medical is a soft, comfortable and breathable external catheter that can be an excellent alternative to more invasive intermittent catheters. This product is transparent to allow easy monitoring of the skin and features balanced adhesives which provide secure reliability and skin friendliness. Male patients suffering from urinary incontinence can choose from a variety of options to treat this common condition. Treatments can include incontinence briefs, pads, clamps or catheters. The Conveen Optima Catheter is a great external catheter solution and can be used in combination with a leg bag providing a complete urinary incontinence system. Additional extension tubing can be purchased to allow a more convenient and efficient setup. The featured push ring on this system ensures a secure connection to the tubing and valve of the collection leg bag. 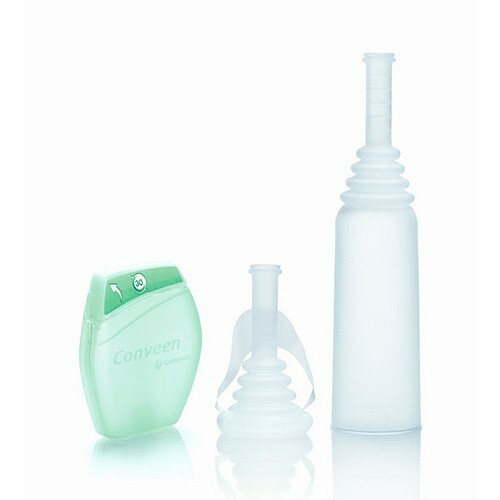 BUY the Coveen Optima Catheter from Vitality Medical today. You can quickly and easily wash your catheter using warm soap and water. Heat activates adhesive; hold in your hand to initiate the activation process. Pay attention to fit; how the catheter fits is significant and will make the difference between a pleasant user experience and an unpleasant one. Make sure skin is clean, dry and free from oils and moisturizers. Choose from four circumference sizes in Sport length for short/retracted shafts. 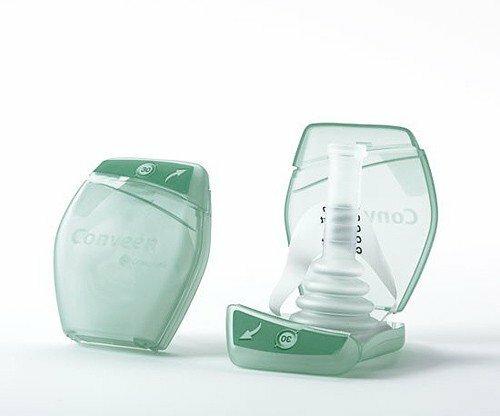 Want to try the Conveen Optima catheter? You can try out this catheter before you purchase it by requesting a free sample of the Conveen Optima. Packaged discreetly with a hard cover, making it difficult for other people to identity it as condom catheters. Do you ship these to the UK ? If so, how much is the shipping cost ? We are able to ship overseas at an additional cost. To view the shipping fees, simply add the item to your cart, then select "International Checkout." Choose the country and the cost for shipping will show there with the proper conversion rate. How to remove the condom when it's time? I purchased a box of Coloplast Convene Optima, external catheters for my husband. The box of 30, was defective. Every time I used one on my husband, they did not stay on. The adhesive is no good, resulting in a big mess. I called Vitality, explained the problem, they said someone would get back to me and never did. I even offered to return the rest of the unused items in the box. I received samples from manufacturer and they work great. After trying many samples this is the only condom catheter I've found that works for my husband. They are easy to apply and usually stay on for 24- hours unless I have to turn or transfer him a lot. I take a supply with him if he has to be hospitalized and the nurses always ask their supervisors to order these instead of the ones they use. Conveen condom catheters are packaged for easy handling. The pull tab makes application easy. The catheter stays in place and yet is easy to remove. Excellent product and prompt service. Thank you. we won't be able to buy any more of these condom catheters as you do not offer them in a size that fits, 28mm, we like the pull tab but the condoms keep falling off and the 25mm is painful.